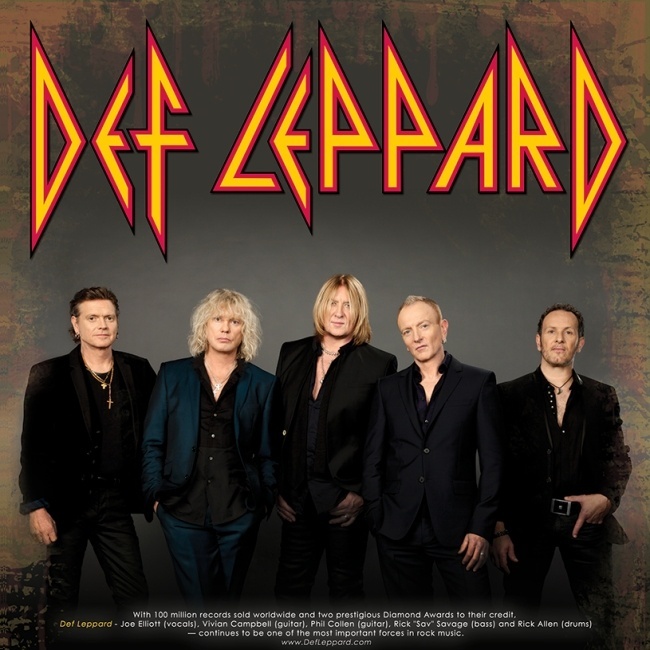 Def Leppard will embark on a 13 date tour of Canada in April/May 2015 it was announced earlier today by local press. The band will start the tour on 15th April in Penticton, BC and wrap up on 5th May in London, ON according to the Edmonton Sun. This will be the band's first run of Canadian shows since 2008 when they played five shows in the country. Their last full length nationwide tour was in 2005 when they played 12 shows during the Rock of Ages tour. Since then they have only played one date in Toronto (2009/2011), Hamilton/Montreal (2012), two festival shows in 2013 and another single date in Toronto earlier this year. This will be the first time the band have played in Penticton, Dawson Creek and Lethbridge. Five cities have not been played since the 2007 Downstage Thrust tour - Victoria, Vancouver, Calgary, Edmonton and Saskatoon. Winnipeg, Ottawa and London get their first visits since the 2008 tour. Regina was last played in 2003 and Montreal was played on the 2012 tour. The tour features an as yet unannounced support act and the return of the Thrust Stage. 24 shows have now been announced for the 2015 world tour. Played for the first time. The first show in Victoria since September 2007 on the Downstage Thrust tour. The first show in Vancouver since September 2007 on the Downstage Thrust tour. The first show in Calgary since September 2007 on the Downstage Thrust tour. The first show in Edmonton since October 2007 on the Downstage Thrust tour. The first show in Regina since September 2003 on the X/Ten tour. The first show in Saskatoon since October 2007 on the Downstage Thrust tour. The first show in Winnipeg since August 2008 on the Songs From The Sparkle Lounge tour. The first show in Montreal since July 2012 on the Rock of Ages tour. The first show in Ottawa since August 2008 on the Songs From The Sparkle Lounge tour. The first show in London since 7th August 2008 on the Songs From The Sparkle Lounge tour. "Def Leppard, one of the world's more enduring rock acts, will wrap up its 13-stop Canadian tour in London this spring." "Announced on Dec. 9, the 2015 tour will take in major venues across the country, kicking off in Penticton, BC on April 15 before wrapping up in the Forest City on May 5."